Car Accident Lawyers – Who Pays for Car Damage in an Accident? You are here: Home / Car Accident / Who Pays for Car Damage in an Accident? Who Pays for Car Damage in an Accident? Car accident lawyers are often asked who actually pays for car damage after an auto collision. The simple answer is that the party responsible for the accident or their insurance company is liable to pay damages. Let’s take a look at scenarios where an accident is caused by another driver or by you. When another driver is responsible for an accident, he or she will generally be held accountable for any damage to your car. However, different situations could still play a factor, including the following. If the driver responsible for the accident carries liability insurance, this works in your favor. Such coverage helps the insured to pay for damages they are legally responsible for. 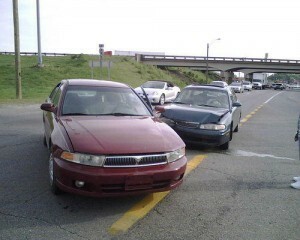 It gets more interesting when both the driver responsible for the accident and you have insurance coverage. Let’s say you have collision coverage auto policy, while the other party has liability coverage. In this case, either party could pay for the car damage. But since the other driver is responsible for the accident, it makes sense to let his or her insurance company pay for the damage. This will save you from having to make payment for your deductible. In addition to this, the other driver’s insurer will often provide you with a rental car while you wait for your own car to be repaired. If the driver who caused the accident is uninsured, you will likely have to look to your own insurance company for assistance. However, it is pertinent to note that you may not get any assistance from your insurer if you do not already have collision coverage. If you have a collision policy, your insurer may only pay you up to a particular threshold for the repair of your car, while you take care of any excess costs on your own. Car accident lawyers at our law firm would be happy to assist you in recovering compensation from your insurance company. In many cases, your insurance company will pay for car repairs, even when you are the party at fault. However, you will need to have collision coverage to have this benefit. This policy is described as a no-fault coverage. However, you will likely need to pay a deductible to take care of part of the cost of auto repair. If your car has been damaged in a car accident, and you are finding it hard to recover damages, get in touch with car accident lawyers at The Hoffmann Law Firm, L.L.C. Call us today at (314) 361-4242 or fill out our Online Contact Form to schedule a free consultation with an experienced St. Louis auto accident attorney.